Now that we're in the kitchen, we're on the scene where American meals are planned and made. Here, the fat content of many meals can be cut or multiplied. "Ahem & didn't your doctor say to cut down on fat?" "Yes, I know, but 'no fat, no flavor.'" The truth is you can get flavor without fat. You just have to use different techniques and seasonings. "Have you thought about using different herbs and spices to get flavor?" "Well, no. Can you do that?" For instance, season your chicken with lemon, some garlic, a dash of pepper, and a little salt or salt substitute or whatever spices you like. Then, instead of frying it, broil it. And before eating it, remove the skin. For those fat-saturated hush puppies, why not substitute some fresh corn on the cob with a little liquid margarine? Vegetables taste great if they're steamed, and seasoned with herbs. "Looks good. Smells good. But the proof is in the tasting. Say, this tastes good!" And guess what? If you prepare your foods in low-fat ways, you can eat even more food but still get a lot less fat. Let's take a look at what you were going to eat. That meal contains about 740 calories, 34 grams of fat, and 9 grams of saturated fat. With the other meal, you still eat 740 calories, but it only has 18 grams of fat, and 3 grams of saturated fat. As you can see, a few changes can mean big fat savings. Cooking food low in fat and cholesterol can be as fun and easy as you make it. Here are some more tips. Try steaming foods. 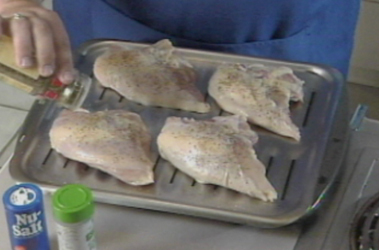 Broiling meats is a good no-fat cooking method. Other methods include microwaving and baking, and trim excess fat from meat before cooking. For seasoning, use fat substitutes. Try a butter-flavored powder or liquid instead of the real thing -tastes great on noodles or baked potatoes. Or try some salsa to liven things up. Add just a little oil when stir-frying. Rather than pouring dressing over your salad, dip your fork in the dressing and then into the salad. Add just a touch of mayonnaise to your sandwich. In your recipes, replace each egg yolk with two whites, or use a commercial egg substitute. Remember, there are many low-fat cookbooks and cooking classes now available, so take advantage of them. Now, let's look at some practical examples of how to make low-fat eating a part of your life. For breakfast, skip the sausage, cheese and egg biscuit. Instead, have pancakes with syrup or fruit, and low-fat milk and juice. Or lose the bacon and eggs and biscuit, and choose a bowl of cereal with non-fat milk, a banana and a bagel with fat-free cream cheese. At lunch, instead of a big cheeseburger and fries, substitute a grilled chicken breast sandwich with lettuce and tomato, a side salad with low-fat dressing and some fresh fruit. At dinner, instead of half a pepperoni pizza, have two slices of vegetable pizza, and a bowl of minestrone soup. Still hungry? Add a large salad with fat-free salad dressing. Instead of stir-fried Kung Pao chicken with an egg roll, try chicken chow mein with steamed rice. If you have any questions on choosing and preparing foods wisely, a registered dietitian can help.